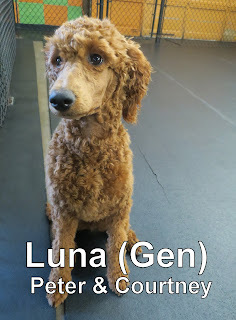 This morning we had the pleasure of meeting Luna. She is a four-month-old, twenty-five-pound, Red Standard Poodle. Luna is a very confident puppy, she joined our Medium Dog Program and immediately started playing. The first dog she met was Frankie the Red Labradoodle, and the two of them played nonstop. She also played with Zoey and Nia. She did a great job today, and is welcome back anytime. We hope to see her again soon! Check out this clip of Luna tearing it up with Frankie. Hugo came into the Fort for his assessment yesterday. 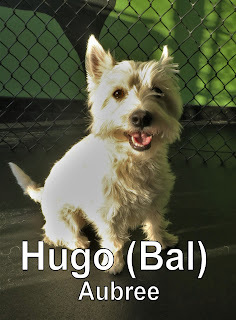 He is a three-year-old, nineteen-pound, Westie. He also joined our Medium Dog Program. Hugo speaks good dog and will play with anyone who is willing. Yesterday, he played with Bogie, Frankie, Nia, and Fonzie. He passed his assessment with flying colors, and is welcome back any time. We look forward to seeing him again soon. Here is a clip of Hugo playing with Fonzie.